Ever since I was a little girl, I remember the one thing I would look forward to every day was my evening snack. After coming back from school and before going out to play or doing homework, I would just hang around the kitchen bugging my mom to see what she would be making that evening! Not only did I want an evening snack, but it also had to be something different from whatever I had been eating for the last few days. Good old cookies and chips just would not cut it with me 🙂 It got to the point that my mom would get a headache just trying to think of something new and delicious to make for me! Thankfully, my kids don’t bother me about it like I used to bother my mom, but I still enjoy an evening snack with my cup of tea! 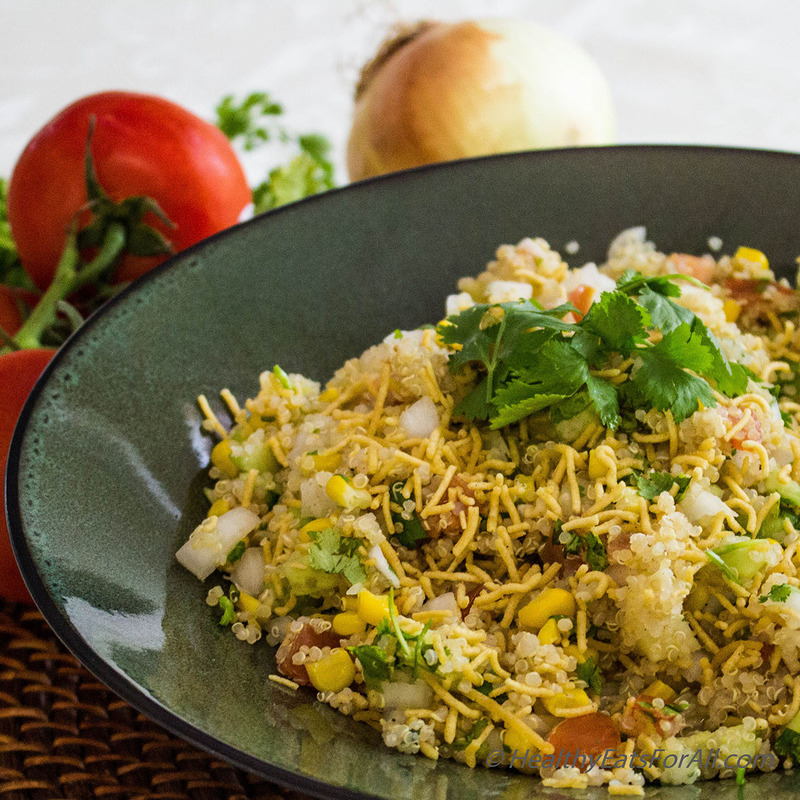 One of my favorite snacks is called Bhel, or Bhelpuri. 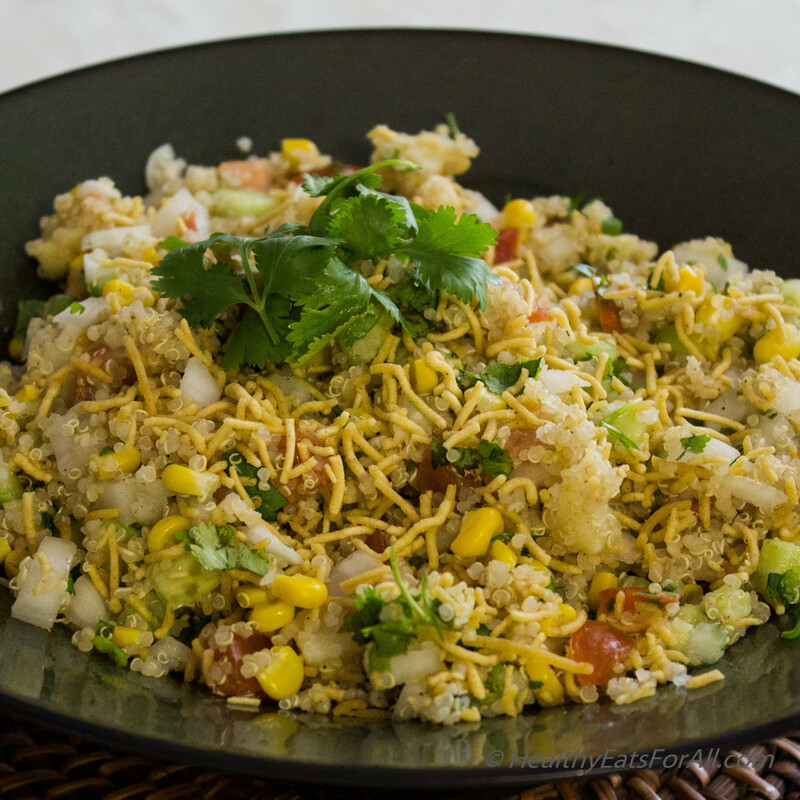 This is a popular street food in India made with bhel mix – a mixture of puffed rice & bhujiya (savory chickpea flour noodles) -available at Indian grocery stores as a pre-made mix. You can also buy the two separately and mix them yourself. The traditional bhel is given a finishing touch with some sweet, tangy tamarind chutney to balance out the salt and spices. If you want to serve this as party appetizer, be sure to add the lemon juice and chutney at the end so that it doesn’t get soggy. 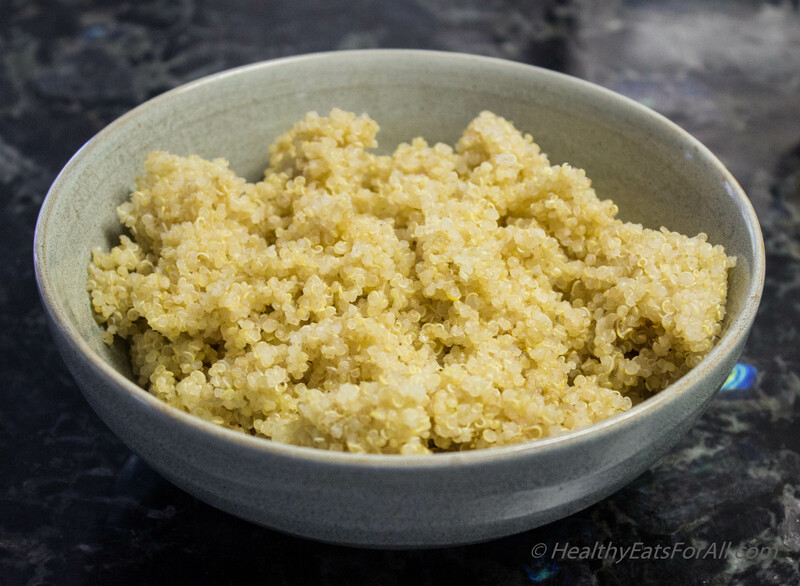 Make sure the cooked quinoa and boiled potatoes have cooled down. Add all the vegetables and quinoa to a large bowl. Add the salt, black pepper, lemon juice, chaat masala and mix well. Feel free to add any red chili powder if you prefer it spicier! For the traditional slight sweet flavor in bhels add the tamarind chutney, and for the final touch add the bhujiya for some crunch. Enjoy as an evening snack with tea or as a side salad! I am entering this recipe for the No Croutons Required challenge from Lisa’s Kitchen! This recipe is also being entered in the Eat your Greens Challenge! This recipe has also been entered in Extra Veg Blog Challenge and Food & Fitness Friday. I’ll take two servings, please! 🙂 That looks AMAZING. Thanks for stopping by Food & Fitness Friday! 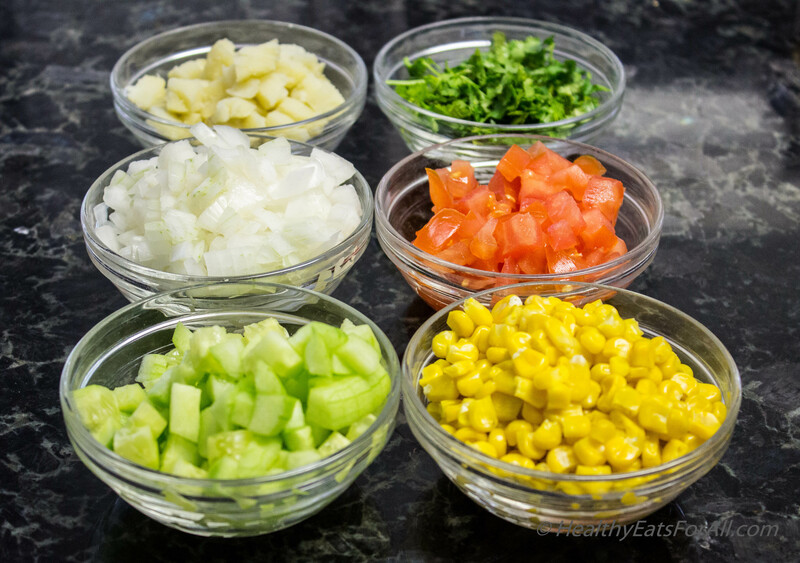 The pictures and the very thought of bhel is mouth watering. I will try it today. What is the meaning of non GMO? GMO means Genetically Modified Organisms. Foods that have been genetically engineered or altered are GMO. So non-GMO foods are ones that have NOT been altered genetically. Below is a link that gives you more detailed information on this topic. 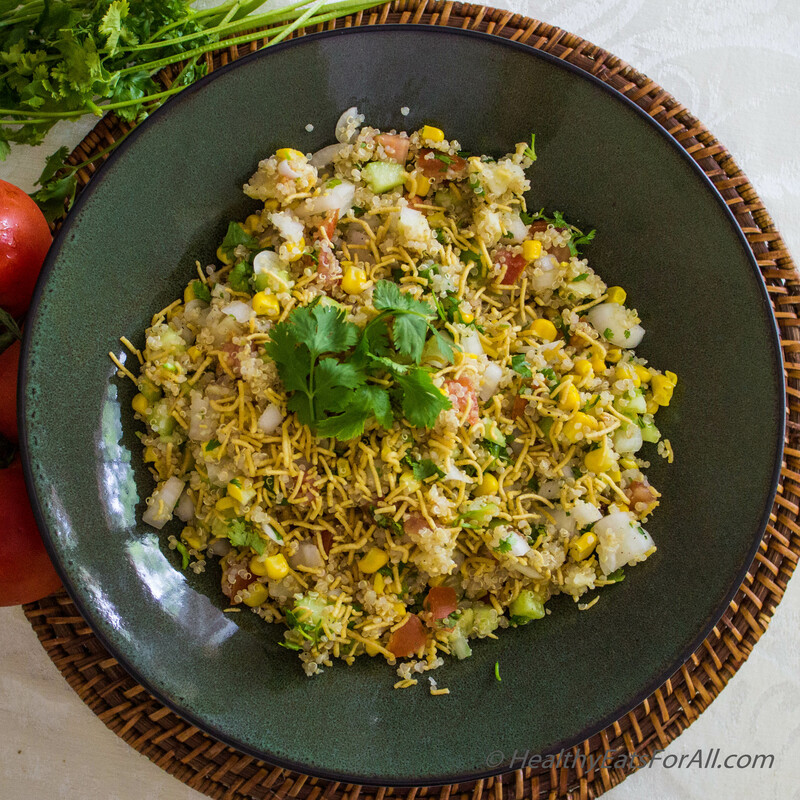 I hope you try this delicious bhel and do like it!